The grey wolf is one of the world's most polarizing and charismatic species. Respected, adored, or held in awe by many as an icon of wilderness, wolves have also sparked fear and hatred when they have come into conflict with human presence. Not surprisingly, they are one of the most intensively studied mammalian species in the wild. 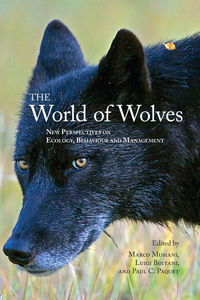 The World of Wolves : New Perspectives on Ecology, Behaviour, and Management, offers a fresh and provocative look at current trends in wolf and wildlife management. Representative case studies, from geographically and culturally diverse areas of the world, highlight the existing interconnections between wolves, their prey, their habitat, their ecosystems and people, and the role of science in policy formation and wolf management. In addition, the studies involve many issues (for example, population genetics and livestock husbandry practices) that are entry points into larger aspects of ecology and evolution. This book will appeal to conservationists, scientists, wildlife managers, and anyone seeking a better understanding of wolves and their co-existence with us.